Public safety officers put their lives on the line to keep others safe. It’s part of the job description. While the rest of us try to get out of harm's way in a crisis, they run into the thick of it. The nature of that work exposes them to tough and traumatic events. It takes a toll. Canada must do a better job of addressing post-traumatic stress injuries and the mental wellness of public safety officers. It's vital that we do. We must ensure that our front-line personnel can remain strong and healthy so they can continue to keep Canadians safe. That’s why, as the Minister of Public Safety and Emergency Preparedness, in partnership with the Minister of Health, we are releasing Supporting Canada’s Public Safety Personnel: An Action Plan on Post-Traumatic Stress Injuries. This Action Plan is the result of several consultations that began in January 2016. From the outset, we have been guided by front-line public safety personnel and their families, unions, management, governments at all levels, academics and scientists, and non-government organizations. While public safety personnel work in multiple jurisdictions, each with their own responsibilities for providing mental health supports to their employees, there is a clear need for country-wide leadership on these challenges they all face. The Government of Canada is committed to national leadership to support the mental health of public safety personnel, providing coordination, facilitating collaboration, sharing best practices, and funding cutting-edge research. This work will support prevention, early intervention, stigma reduction, care and treatment for all types of public safety personnel, all across the country. Central to these efforts is the new National Research Consortium by the Canadian Institute for Public Safety Research and Treatment (CIPSRT) and the Canadian Institutes of Health Research (CIHR), backed by a $20 million federal investment. Research is essential to addressing the lack of evidence in Canada about what treatments and tools work to address post-traumatic stress injuries (PTSI) in public safety personnel. As part of the $20 million federal investment in the National Research Consortium, CIHR recently announced $11 million in grants for research into PTSI in public safety personnel. I sincerely thank all those that have collaborated on this Action Plan, and especially those on the front lines. Society has a duty to safeguard the physical and mental health of our public safety personnel, and to rescue them—when they need our help—just as they never hesitate to rescue us. We have laid a solid groundwork to support Canadian public safety personnel. We are working to better address the unique stresses and mental health challenges that front-line workers can face through exposure to traumatic events. This Action Plan signals the importance of improving our understanding of post-traumatic stress injuries through research, and of working together to help this dedicated community raise awareness, improve resiliency, fight stigma and improve the lives of all affected by post-traumatic stress. The Minister of Public Safety and Emergency Preparedness’ mandate letter, issued November 12, 2015, featured a commitment to work with provinces and territories and the Minister of Health to develop a coordinated national Action Plan on Post-Traumatic Stress Disorder, which disproportionately affects public safety officers. Starting in 2016, Public Safety and the Health Portfolio undertook several consultations with stakeholders (e.g., federal, provincial and territorial governments, public safety organizations, academia, union representatives, mental health professionals and non-governmental organizations) to inform the development of this Action Plan. Starting in 2016, Public Safety Canada, its Portfolio, and the Health Portfolio undertook several consultations with stakeholders (e.g., federal, provincial and territorial governments, public safety organizations, academia, union representatives, mental health professionals and non-governmental organizations) to inform the development of this Action Plan. These consultations have reinforced the importance and urgency of working collaboratively across the public safety community to identify, implement and monitor concrete actions which will support positive mental health outcomes for Canada’s public safety personnel. We have heard from the community that collective attention on this issue is required now. Through the Action Plan we will seek to strengthen our collective understanding of post-traumatic stress injuries through research, including applied research and treatment trials; supporting mental health resilience through evidence-based research to inform public awareness, training and other initiatives that emphasize prevention, early intervention and stigma reduction; and identifying ways in which public safety organizations can better monitor and manage the mental health of public safety personnel through support for care and treatment. The Action Plan will seek to strengthen our collective understanding of PTSI through research and data collection; supporting mental health resilience through evidence-based research to inform public awareness, training and other initiatives that emphasize prevention, early intervention and stigma reduction; and identifying ways in which public safety organizations can better monitor and manage the mental health of public safety personnel through support for care and treatment. While public safety personnel work in multiple jurisdictions, each with their own responsibilities for providing mental health supports to their personnel, there is a clear and urgent need for country-wide leadership on the challenges they all face. Public Safety Canada is uniquely positioned to provide this national leadership on the Action Plan, given the Department’s broad mandate, Portfolio partners, other government departments and agencies, and established relationships with both the public safety community and provincial/territorial governments. Through coordination, facilitating collaboration, sharing best practices and funding cutting-edge research, Public Safety Canada and its partners will work towards implementing this Action Plan in order to support and strengthen the mental health outcomes of public safety personnel. The Action Plan is an important step in a long-term approach to address mental health issues affecting public safety personnel, and progress toward achieving key actions will be reviewed on an annual basis over the next five years. The Action Plan will be maintained as a living document, informed by evidence-based research; best practices; emerging trends, barriers and gaps; and stakeholder feedback. “Public safety personnel” is a term that broadly encompasses front-line personnel who ensure the safety and security of Canadians across all jurisdictions. Examples can include: tri-services (police – including the Royal Canadian Mounted Police, firefighters and paramedics), correctional employees, border services personnel, operational and intelligence personnel, search and rescue personnel, Indigenous emergency managers, and dispatch personnel. Public safety personnel play a critical role in safeguarding Canadian communities by maintaining order, saving lives and protecting property and the environment, often at great personal risk. Public safety personnel are unique in that they are repeatedly exposed to traumatic experiences in stressful situations (e.g., responding to suicides, accidents and disasters), which can take a significant toll on their mental health and well-being. These experiences can leave them vulnerable to suffering mental injuries. A number of terms are used to capture the range of symptoms and health concerns caused by exposure to these situations. These persistent psychological difficulties sustained while serving as public safety personnel are often referred to as post-traumatic stress injuries (PTSI), post-traumatic stress disorder (PTSD), and operational stress injuries (OSI). The term PTSI is a non-clinical term that encompasses a range of mental health injuries, including some OSI, clinically-diagnosed PTSD, anxiety, and depression. It characterizes symptoms as injuries caused to public safety personnel as a direct result of their work. PTSI can have a lasting impact on a public safety personnel’s ability to do their job, as well as affect their overall mental health and well-being. Public safety personnel have strongly advocated for the use of the term PTSI as it helps to reduce the stigma typically associated with clinically-diagnosed PTSD and recognizes that exposure to trauma may cause other forms of mental health injuries. By using the term PTSI in the Action Plan, the Government of Canada aims to reinforce its intent to support the overall mental health and well-being of all public safety personnel. The term “post-traumatic stress injuries” (PTSI) is a non-clinical term that encompasses a range of mental health injuries, including some operational stress injuries (OSI), clinically diagnosed Post-Traumatic Stress Disorder (PTSD), anxiety, and depression. Clinically-diagnosed PTSD can be best described as an extreme reaction to exposure to trauma. PTSD may develop following either direct or indirect exposure to actual or threatened death, serious injury or sexual violence. Direct exposure may occur through experiencing singular or multiple traumatic events or through witnessing such an event happen to others. Indirect exposure may occur when learning about a traumatic event that has affected close relatives/friends or when exposed to details about an event through work. Traumatic experiences may include natural disasters, crimes, accidents, war or conflict, or other threats to life or safety. arousal (hypervigilance, reckless or self-destructive behavior, irritability or angry outbursts, and sleep disturbances). A diagnosis of PTSD requires that a certain proportion of these symptoms be present for more than one month and cause significant distress or impairment of functioning. As with most mental disorders, the biological processes involved in PTSD are not fully understood. It cannot be explained why people who experience the same event might either develop PTSD or experience no symptoms. OSI is not a diagnosable mental disorder, but may be used to refer to one or more specific diagnosable mental health disorders or to another mental health problem. OSI is used to describe a broad range of problems including diagnosable mental health disorders such as anxiety disorders, depressive disorders, and PTSD, as well as mental health problems that may not meet diagnostic criteria, but still interfere with daily functioning in social, work, or family activities. Colloquially, the operational stressors associated with an OSI typically refer to potentially psychologically traumatic events; however, in some cases operational stressors also refers to other elements of operational duties (e.g., shift work, overtime, upholding a “higher image” in public). 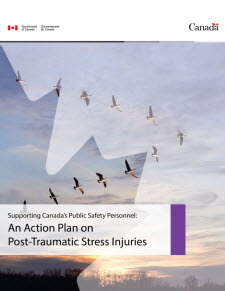 While PTSI, PTSD and OSI are all distinct terms, taken together they capture the range of symptoms and health concerns that the Action Plan is looking to address. 2.2 How Do Post-Traumatic Stress Injuries Impact Public Safety Personnel? Public safety personnel face traumatic experiences unique to their occupations on a daily basis (e.g., responding to crimes, accidents, or natural disasters that include serious injuries, deaths, or threats to lives). In Canada, it is estimated that there are: 69,000 police personnel; 110,000 firefighters (80,000 volunteer and 30,000 full-time); 30,000 paramedics; 17,000 correctional services personnel; over 7,000 border services personnel; and 18,000 volunteer search and rescue personnelFootnote2. Public safety personnel face traumatic experiences unique to their occupations on a daily basis (e.g., responding to crimes, accidents, or natural disasters that include serious injuries, deaths, or threats to lives). Given the specific nature of their duties, public safety personnel may also face unique obstacles, including: recurrent exposure to trauma; persistent stigma; and limited access to treatment options that address their specific experiences. In 2016, the Journal of Community Safety and Well-Being estimated that 70,000 Canadian non-federal tri-services personnel have suffered from PTSD. There is a lack of research on post-traumatic stress injuries among public safety personnel and the Government of Canada has announced investments of $40 million to date to help close that gap. At the same time, public safety personnel with injuries need to have immediate access to care and treatment so that they can be strong and healthy, and continue to keep Canadians safe. The Action Plan will support public safety organizations’ work to provide their employees with appropriate care based on best practices from across the country. However, there is currently a lack of research and baseline data on the mental health and well-being of public safety personnel. This limits the collective ability to: quantify the extent to which people are affected by PTSI; identify evidence-based interventions and treatment options; and make informed decisions on policies and programs that can support public safety personnel. The Government of Canada recognizes the urgency for immediate action. Many stakeholders, including all levels of government, public safety organizations, academia, not-for-profit organizations, and other national partners, have undertaken a variety of efforts to support public safety personnel. However, at present there is insufficient research that can soundly recommend which treatments or interventions effectively work for public safety personnel, and those which do not. We have heard that for many the situation is at a crisis level and that the need for action is dire. Living with PTSI takes its toll: on the individuals, on their jobs, their families, colleagues and friends, and ultimately on their overall well-being. Tragically, for some, it is the ultimate toll, either taking or dramatically altering their lives. Consultations with stakeholders have identified three areas of focus for the Action Plan: 1) investing in research and data collection; 2) advancing efforts in prevention, early intervention and stigma reduction; and 3) support for care and treatment. Interrelated and complimentary, these areas of action collectively undertaken will provide a foundation for supporting public safety personnel. In Canada, there is a lack of evidence-based research regarding PTSI in public safety personnel, meaning that efforts to identify appropriate treatments and other tools are limited and would not be based on solid data. This underlines the vital importance of investing in quality research which will be applied to real-life situations and tailored to the unique needs of public safety personnel. A collaborative approach to research and data collection requires the development of partnerships between multidisciplinary stakeholders, to ensure that the results directly inform the provision of support for public safety personnel at risk of and suffering from PTSI. Ensure a common recognition and understanding of the terms PTSI and OSI across public safety sectors. Establish a hub for research excellence and knowledge translation that can provide national leadership on mental health issues in public safety personnel, and disseminate information systematically across disciplines, and to public safety organizations directly. Promote opportunities for researchers across Canada to undertake research that aims to: enhance the lives of all public safety personnel and their families; investigate the nature of PTSI and other OSI; and develop new and innovative prevention, screening, education, intervention and treatment measures for PTSI. Explore options to systematically collect data within public safety organizations, as well as nationally. Evaluate the effectiveness of existing intervention and treatment options for public safety personnel. Promote the dissemination and use of key research and data findings as the foundation for evidence-based decision making across all levels of government and within public safety organizations, such as developing and sharing an inventory of treatments and interventions, complete with recommendations. There is a need to undertake efforts to promote awareness and early intervention for public safety personnel who are at risk of, or are struggling with PTSI. This will not only help improve their mental health and resilience, and provide them with tools to help them seek support, but also help normalize these issues within public safety organizations, and the general public. Provide a forum for public safety organizations to discuss, exchange and be aware of evidence-based prevention, early intervention and stigma reduction initiatives or tools which they may then implement within their own organizations. Work with stakeholders and partners to identify ways in which public awareness efforts can be advanced within public safety organizations, and among personnel and their families. Provide a forum whereby evidence-based research can support public safety personnel in identifying training opportunities that would contribute to their mental resilience. Explore existing screening practices for mental health issues during recruitment and disclosure of information at enrollment (and associated ethical and privacy concerns). Share best practices with respect to effective initiatives. Public safety personnel need to have access to effective, timely and affordable care and treatment options. The Government of Canada is committed to providing national leadership on this issue, while recognizing that public safety personnel work in multiple jurisdictions, each with their own responsibilities for providing mental health care. The Action Plan aims to examine ways in which public safety organizations and health care professionals can better monitor and manage the mental health of public safety personnel, so they can seek the treatment that is most appropriate to their individual needs. Examine ways in which standardized education materials can be used by public health care providers, who are often the first health care professionals that public safety personnel turn to for assistance with mental health issues like PTSI. Explore new, innovative, and multidisciplinary treatment options, including Internet-based Cognitive Behavioural Therapy. Identify opportunities to support accessible, affordable and effective treatment options, particularly in rural and remote communities. Study the presumptive legislation for public safety personnel introduced by several provinces and examine the implications for those under federal jurisdiction. This legislation enables faster access to benefits and treatment as public safety personnel who suffer from PTSI do not have to prove it is as a result of their work. Share best practices on effective initiatives (e.g., disability case management, reintegration and return-to-work programs and peer support networks). Since the release of the mandate commitment in November 2015, and given the urgent call for action, some significant milestones have already been undertaken to support mental wellness outcomes of public safety personnel. Actions to date include listening to stakeholders impacted by PTSI through consultations; directly contributing to making a difference through concrete investments; recognizing the impact of PTSI on first responders through support for families; and leveraging other federal initiatives to advance our collective knowledge. On January 29, 2016, Public Safety Canada hosted a Ministerial Roundtable at the University of Regina on the impacts of PTSD on public safety officers. The Roundtable brought together over 50 members of academia, not-for-profit organizations, union representatives, tri-services leadership (i.e., firefighters, police and paramedic professional associations), operational public safety personnel and other levels of government to the table to discuss the threat posed by OSIs in public safety officers. In September 2016, a national health-focused roundtable was held in Ottawa where mental health professionals, public safety personnel and government officials explored options for improving support for care and treatment. A tri-services consultative group was established to advise the federal government on the development of the Action Plan and ensure its alignment with the needs of public safety personnel. Through these national consultations, three areas of need were identified which informed the interrelated pillars of the Action Plan. These needs were reinforced by the October 2016 report of the House of Commons Standing Committee on Public Safety and National Security (SECU) “Healthy Minds, Safe Communities: Supporting our Public Safety Officers Through a National Strategy for Operational Stress Injuries”. The report’s recommendations align substantially with the Action Plan, including an emphasis on coordinated research, early interventions, and support and treatment for public safety officers. Budget 2018 committed $20 million over five years to support a new National Research Consortium on PTSI among public safety personnel between the Canadian Institutes of Health Research and the Canadian Institute for Public Safety Research and Treatment (CIPSRT). $10 million toward a longitudinal study of the mental health of RCMP new recruits that will help develop appropriate mental wellness and remedial strategies for the RCMP and other emergency response organizations. $20 million over five years to support a new National Research Consortium on PTSI among public safety personnel between the Canadian Institutes of Health Research (CIHR) and CIPSRT. This consortium will be the first of its kind in Canada and will work specifically to address the incidence of PTSI among public safety personnel. It will help to establish a national baseline of research on the mental health and well-being of public safety personnel, support knowledge translation activities and provide the evidence needed for decision makers at all levels. The goal is to make the best possible decisions to support the mental health and well-being of public safety personnel. assessment of alternative measures (e.g., yoga) in the management of PTSI. $187,000 to support CIPSRT in facilitating the training of public safety personnel on the Canadian Armed Forces’ Road to Mental Readiness (R2MR) program to increase their mental health awareness and resilience. The Canadian Institute for Public Safety Research and Treatment (CIPSRT) acts as the National Research Consortium’s knowledge exchange hub, bringing together researchers, funded through the Canadian Institutes of Health Research (CIHR), with all relevant stakeholders in order to coordinate activities and move the knowledge created into active use. As an acknowledgement of the critical role that first responders play in protecting Canadians, the Memorial Grant for First Responders is intended to recognize their service and sacrifice, resulting in a well-supported community of first responders and families. Launched on April 1, 2018, the Memorial Grant Program provides a one-time lump sum, tax-free direct maximum payment of $300,000 to the families of first responders who have died as a result of their duties, including deaths resulting from occupational illness or psychological impairment (i.e., suicide) while keeping Canadians safe. Internet-based Cognitive Behavioral Therapy (ICBT) provides public safety personnel who are suffering from PTSI with access to treatment which focuses on changing patterns of thoughts, behaviours and feelings that cause distress or lead to difficulties in everyday functioning. ICBT provides access to online materials (text, images, audio and video) on a weekly basis which is supplemented by therapist supports through a combination of secure e-mails or phone calls. The Action Plan on PTSI has a specific focus on supporting the mental health of public safety personnel and will also be a key component of a broader Federal Framework on PTSD. Bill C-211, otherwise known as the Federal Framework on Post-Traumatic Stress Disorder Act, received Royal Assent on June 21, 2018. Pursuant to the Bill, the Ministers of Health, Public Safety and Emergency Preparedness, Veterans Affairs and National Defence are required to convene a national conference with key stakeholders on the development of a Federal Framework on PTSD to be tabled in Parliament by December 2019. Led by the Public Health Agency of Canada (PHAC), the federal government will work with stakeholders to implement the provisions of the Act. This Federal Framework will have a wider scope, while inclusive of public safety personnel; it will also include other audiences such as military, veterans and healthcare professionals. The initiatives and activities under both documents will be aligned so they are complementary and not duplicative. Both will ensure that information sharing and best practices will be identified and made available to all Canadians impacted by PTSD. Evidence-based research supported by the Action Plan on PTSI which contributes to suicide prevention will also be shared with PHAC in support of the Federal Framework for Suicide Prevention. Published in 2016, the Framework sets out the Government of Canada’s guiding principles and strategic objectives in suicide prevention. It focuses on raising awareness and reducing stigma, better connecting people to information and resources, and accelerating innovation and research to prevent suicide. Public Safety Canada, in collaboration with its Portfolio, the Health Portfolio, national public safety personnel organizations and CIPSRT, will monitor the implementation and key activities of this Action Plan on an annual basis over the next five years. Each year, Public Safety Canada will convene a meeting with these stakeholders to examine progress and identify areas where the plan may need to evolve so that it continues to be a living document. Provincial and territorial governments will continue to be engaged through existing fora so that they can be advised of progress and identify ways in which they may contribute toward the achievement of key actions identified in the Plan. American Psychiatric Assoc (2013). Diagnostic and Statistical Manual of Mental Disorders (5th ed.). Washington DC: Author. The estimates were provided to Canadian Institute for Public Safety Research and Treatment (CIPSRT) on Feb 10, 2017, courtesy of Statistics Canada, based on the 2011 National Household Survey data (99-012-X2011060) with the National Occupational Classification (NOC) and North American Industry Classification System (NAICS) 2007. Wilson, S., Guliani, H., & Boichev, G. (2016). On the economics of post-traumatic stress disorder among first responders in Canada. Journal of Community Safety & Well-Being, 1, 26-31. Carleton, R. N., et al. (2018). Mental Disorder Symptoms Among Public Safety Personnel in Canada. Canadian Journal of Psychiatry.